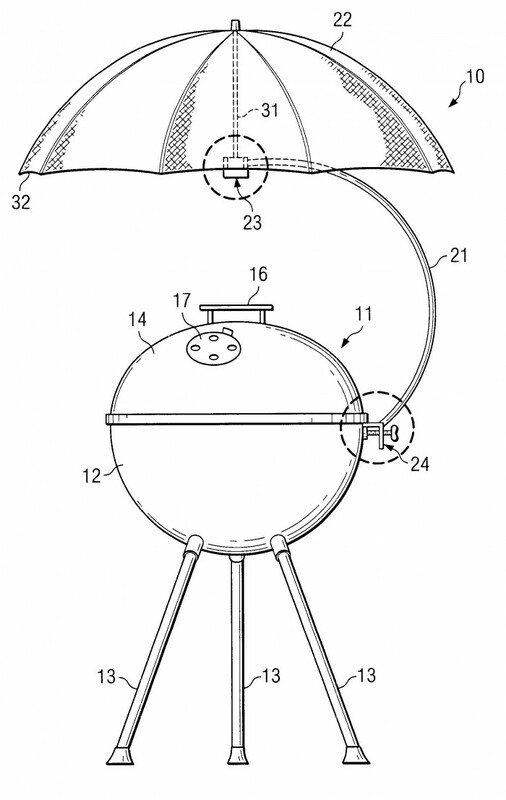 An umbrella assembly according to the invention is suitable for mounting over an outdoor barbeque grill, such as a gas or charcoal grill. 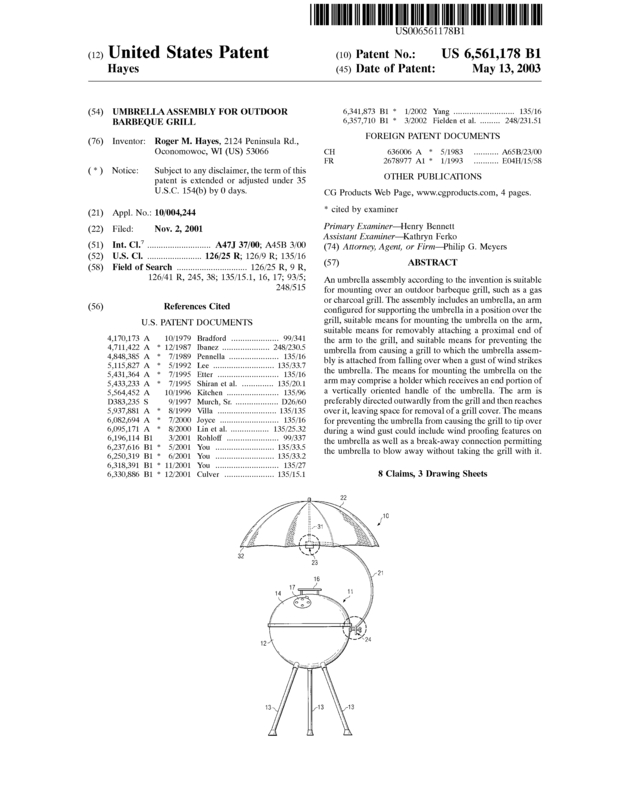 The assembly includes an umbrella, an arm configured for supporting the umbrella in a position over the grill, suitable means for mounting the umbrella on the arm, suitable means for removably attaching a proximal end of the arm to the grill, and suitable means for preventing the umbrella from causing a grill to which the umbrella assembly is attached from falling over when a gust of wind strikes the umbrella. The means for mounting the umbrella on the arm may comprise a holder which receives an end portion of a vertically oriented handle of the umbrella. The arm is preferably directed outwardly from the grill and then reaches over it, leaving space for removal of a grill cover. 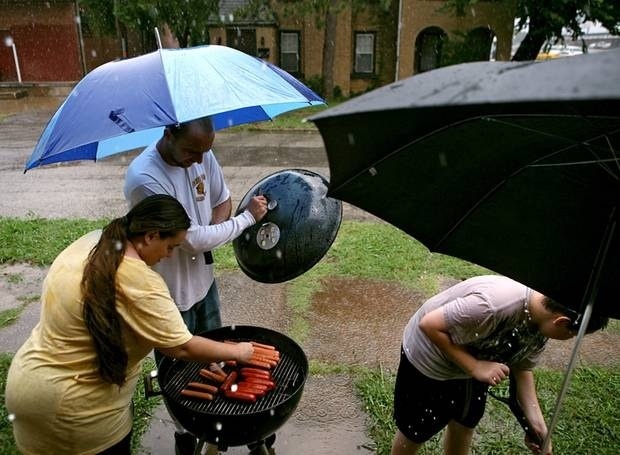 The means for preventing the umbrella from causing the grill to tip over during a wind gust could include wind proofing features on the umbrella as well as a break-away connection permitting the umbrella to blow away without taking the grill with it. Millions of Americans grill outside, and weather can have large impact on the family BBQ or tailgate. After years of grilling out in the rain, snow, or wind, I came up with my grill umbrella design. I've used a homemade prototype and patented the idea and design. The grill umbrella has been a side project for me for years. I am looking for a strategic partner or outright sale at this point, however, since I would like to retire and focus on family. The product has not been sold or marketed yet, so the potential is endless. Licensing possibilities with sports teams, beverage companies, colleges and universities would be fruitful. have a tremendous amount of research on the topic of the outdoor BBQ grilling consumer, and will share that with serious buyers. Page created at 2019-04-24 18:05:33, Patent Auction Time.